No plant defines the British countryside in spring so well as the humble Cow Parsley, every track, lane and roadside laced with its white froth of delicate flowers. With a freshness and abundance that looks forward to the heady days of summer it should make a perfect garden plant. But do not introduce it to your garden: it’s a thug that will seed itself everywhere and swamp every other plant you’re growing. Fortunately, Cow Parsley (Queen Anne’s lace or, botanically, Anthriscus sylvestris) has numerous relatives which, while having those same delicate and airy qualities, are better suited to the garden.. The cultivar, Anthriscus sylvestris ‘Ravenswing’, has almost black fern-like foliage and the same white flower-heads, but with none of the invasive habits of the species. 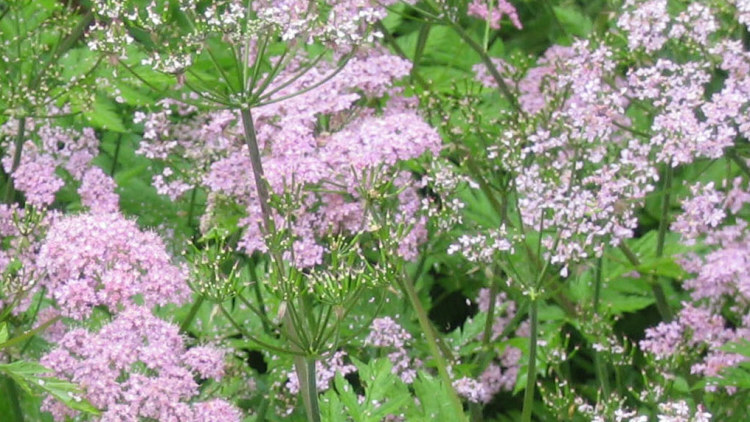 Another form, Anthriscus ‘Vicars Mead’, has similar dark, bolder foliage and pale pink flowers. Plants with the same rounded, umbel-shaped flowers are known as umbellifers. The botanical name of the family used to be Umbelliferae but most botanists now use the less descriptive name of Apiaciae. Umbellifers include eryngiums, astrantias, fennel, angelica, carrots and parsley. Grown together, the similar flower shapes always create a harmonious effect; grown amongst bolder, more formal plants they relax the tone of the planting. The semi-wild appearance of many umbellifers associates well with grasses and meadow annuals to evoke prairie and pasture. The open structure of the flowers make them attractive to bees, hover-flies and lacewings. As garden designers and plantsmen move away from highly bred plants towards more informal ones, umbellifers are being used more and more in modern planting schemes. One of the easiest umbellifers to grow is the annual Ammi Majus, whose almost spherical white flowers are as impressive in the garden as they are in flower arrangements. Ammi grows to about 1m tall and is best planted in large groups. 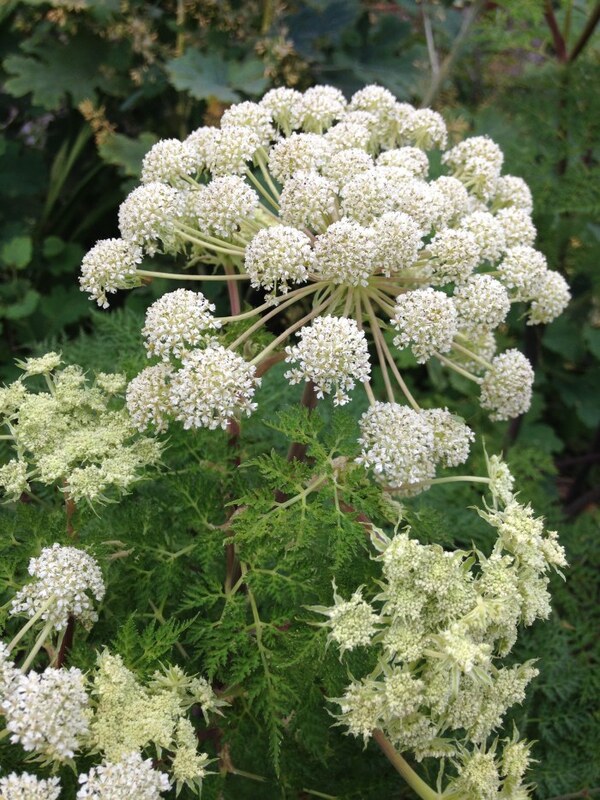 In smaller gardens, where Ammi might be overpowering, try Orlaya grandiflora The flowers of this plant are smaller than Ammi, and cream, but have the same delicacy. Chaerophyllum hirsutum ‘Roseum’ has a similar size and shape but has deep pink flowers. Not all umbellifers are wild and weedy; some have great architectural stature. The imposing domed-flowers of Angelica arcangelica stand 2.5 tall and a single plant can make a dramatic statement in a border. Angelica gigas, with beetroot-red flowers is even more arresting. The most statuesque of the umbellifers, though, is the little-grown Seseli gummiferum. A biennial with uninspiring foliage during its first year it rises from the ground the following year with a strong stem, covered in lacy grey leaves and branches that dance Shiva-like. Each branch holds a cluster of dusky pink flowers, producing a magical effect. With plants like this in the family it is not surprising that umbellifers are moving out of the hedgerows and into the world’s best-designed gardens. Seeds of Ammi majus, Orlaya grandiflora and Angelica can be sown now through until the end of May, either in pots in an unheated greenhouse or directly into the garden where you want them to flower. Prepare the ground by removing any weeds and mark the area you have sown them into so that you do not accidentally weed-out the emerging plants. All umbellifers germinate more easily if the seed is sown fresh, so at this time of year not all your seeds will germinate. From a typical packet of seeds you should get a dozen plants – enough for the average garden. Seeds can also be sown in November or February in pots or trays in a cold greenhouse. Do not use a heated propagating tray as this will inhibit germination. The seedlings can then be potted on and planted out in April or May. After flowering you can collect your own seed to sow the following season or you can let the plants seed around themselves. Most umbellifers need to be grown in well-drained soil in an open sunny situation, although Anthriscus and Chaerophyllum will grow in shade. 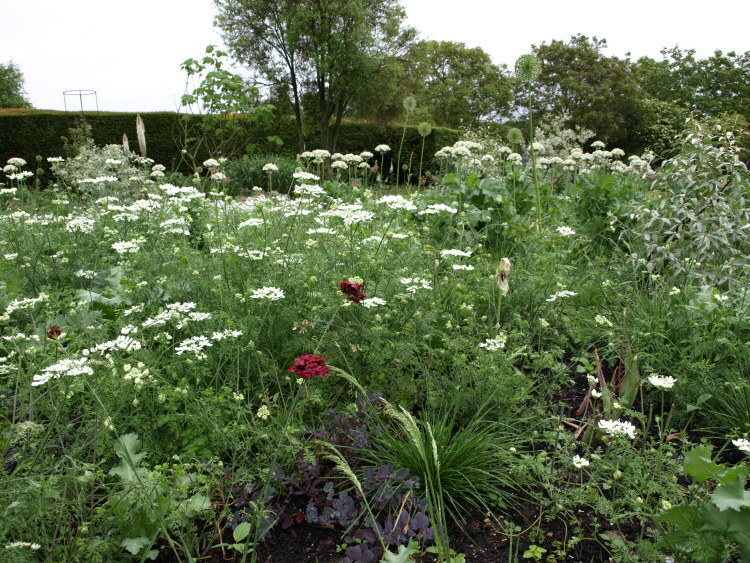 Angelica will tolerate dry conditions although they grow best in richer, moister soil than other umbellifers.